Hello Guys, We sharing some beautiful images, photo, pictures & wallpapers of Rangoon movie. This is an upcoming Bollywood drama film which is directed by Vishal Bhardwaj and produced by produced by Sajid Nadiadwala and Viacom 18 Motion Pictures. Kangana Ranaut, Shahid Kapoor and Saif Ali Khan are playing main lead roles. The trailer of this film has released. Trailer is awesome. The film is a slid romantic drama film. A very intense triangle love story is created between Saif Ali Khan, Sahid Kapoor & Kangana. Rangoon is a period film and set during World War II. Kangana plays the role of Julia, a film actress from the 1940s. She is looking gorgeous and looking so different. He has already played this similar type of role in Once Upon A Time In Mumbaai with Ajay Devgan. Sahid Kapoor is also playing a important role named Nawab Malik and he is an India Troop and other hand Saif Ali Khan is playing a character of a possessive filmmaker. The film has some awesome dialogues are delivered by actors. 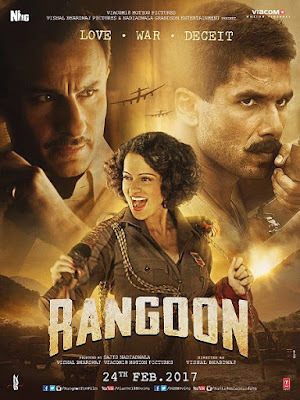 Here We sharing some beautiful looks, images of Kangana, Sahid Kapoor & Saif Ali Khan of Rangoon movie. The film is releasing on 24 February 2017.